There are many questions and undoubtedly surprises in store for 2017. Part of the fun of the new year for marketers is making predictions regarding what the next big thing will be. Small to mid-sized businesses, however, may find that the hottest trends might not always be the most relevant or realistic approaches. Here are the 7 small business marketing trends for 2017 being discussed around the proverbial marketing water cooler this year that we think will stand out. There really isn’t anything new here. Content marketing has been around in one form or another for about as long as the internet and search engines have existed. In the last few years, it’s really taken on a new life and complexity. 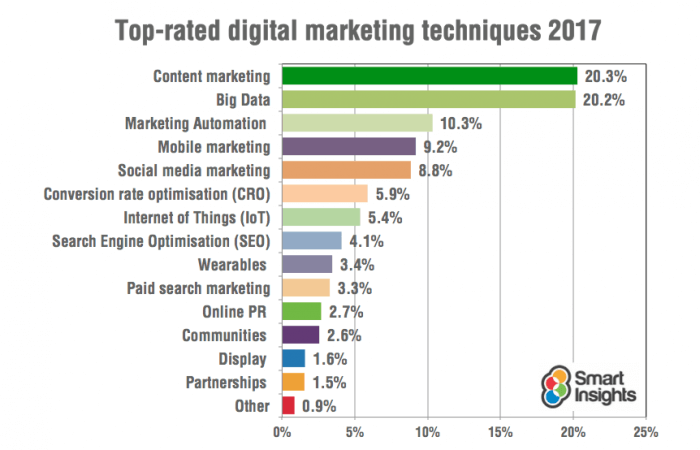 By the look of things, as illustrated by this graphic from Smart Insights, it’s still top of mind for most marketers going into the new year as well. We’ve heard for a few years now that mobile web design is the future. Well, the future is here. More traffic is now coming from mobile devices than desktops. Anyone who isn’t serving their users content that can be easily consumed on a mobile device has missed the boat. If your business doesn’t have a mobile-friendly website, then this should make the top of your marketing priority list for the year. Efficiency has played a role in the transformation of many industries, and its marketing’s turn to see the gains that automation can bring. Say hello to the “set it and forget it” era of marketing. Now, we wouldn’t recommend actually forgetting it, but there are huge gains to be made by turning over some of the repetitive yet effective marketing tasks to email automation workflows. Adding automation to your marketing packages will yield a significant ROI if you implement properly and keep the inbound methodology in mind. Personalization should go hand-in-hand with your marketing automation efforts. Segmenting your audience into lists based on their interactions with your brand, website, and content allows you to serve them content, ads, offers, and more that is in tune with what they are looking for. Personalization, if done correctly, keeps your audience engaged, and keeps your business top of mind. With the introduction of “buy” buttons on social media websites like Facebook and Pinterest, we’ve witnessed the beginning of the next evolution of social media as a marketing juggernaut. While not all small and mid-sized business social media marketing strategies can directly benefit from these “buy” buttons, it should reinforce the idea that your customers are on social media and you should be too. If content is king, then video content is a king maker. Each month, 3.25 billion hours of content are consumed on YouTube alone. Coupled with the fact that only 9% of small business are currently on YouTube, we think 2017 will see a big growth in video content marketing for small and mid-sized businesses. You may have noticed a pattern in the trends for 2017. There’s very little that feels gimmicky about it. All the trends that our digital marketing agency has listed for 2017 are targeted at ensuring that brands connect, and in a meaningful way, with their target audience. Directing your marketing efforts towards niche audiences or verticals within your target market is a great way to develop the content and marketing collateral that drives the meaningful interactions needed to the grow your sales funnel and your bottom line.